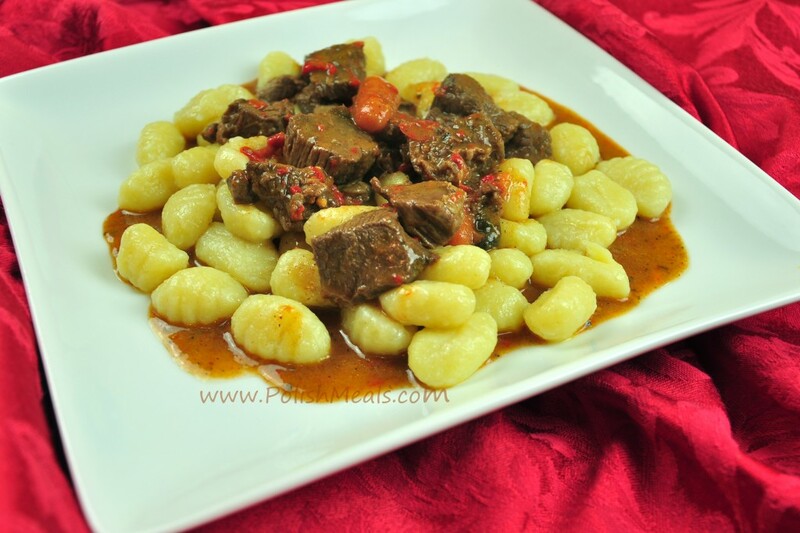 Goulash is another meal borrowed by Poles that became traditional dish in Polish Cuisine. Goulash is a Hungarian soup but in Poland it is cooked to be more like a thick beef stew. Goulash (pol. 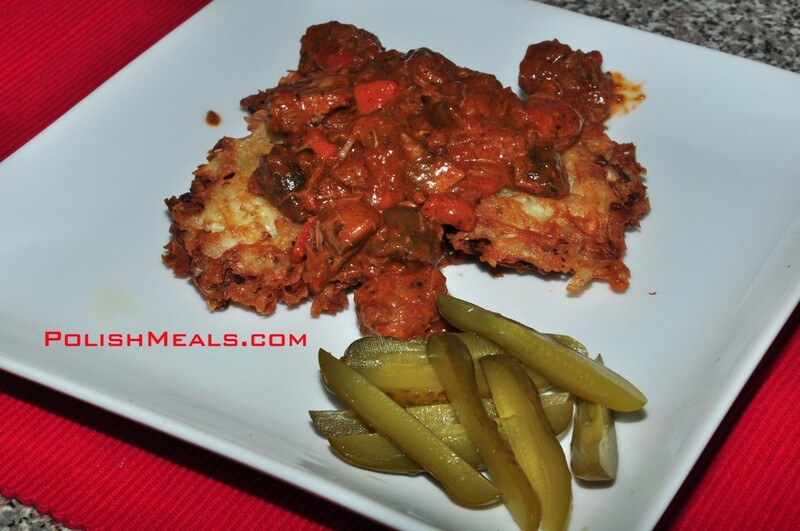 Gulasz) is made of stew Beef, Bell Pepper, Mushroom, Carrot, Onion and Paprika as base ingredients. Cut the meat in about 1 inch cubes. In a small bowl mix together 3 cloves minced garlic, 1 Tbsp Salt, 1 Tbsp Pepper and 1 Tbsp Oregano and 4 Tbsp Olive Oil. Pour it over meat and mix well. The best way it to marinade the meat a day before making Goulash but if you don’t have time it might be the same day. 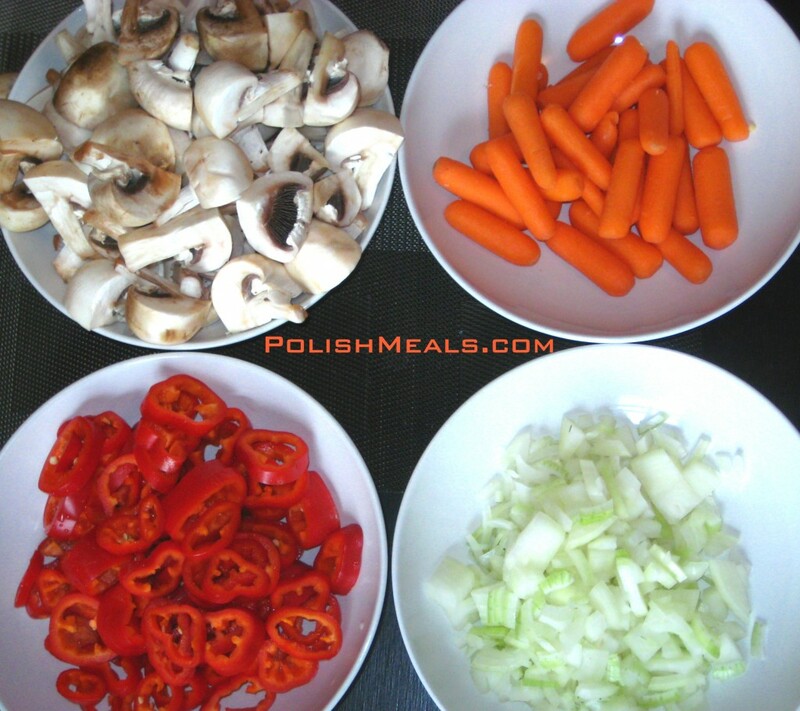 To prepare the veggies: chop the Onion, cut Bell Pepper and Carrot in half inch cubes. Cut Mushroom in quarters or halves. 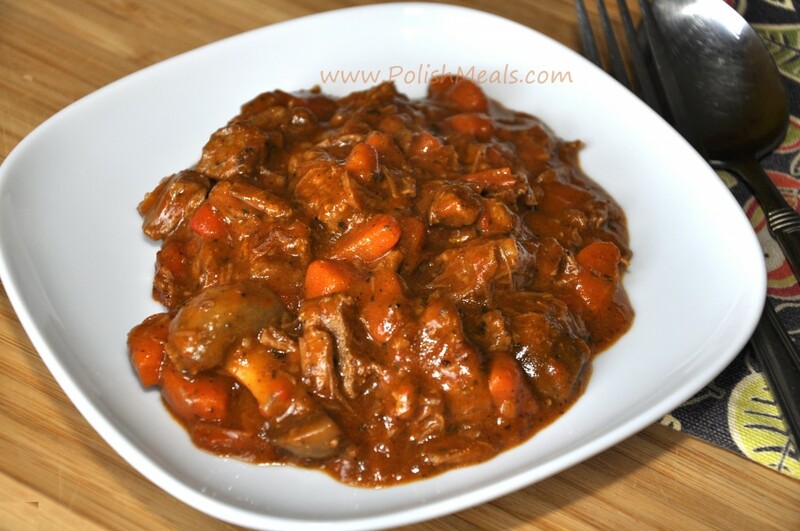 Fry beef in a regular pot and move to pressure cooker and set for 20 minutes. In the meantime: caramelize Onion, the add Bell Pepper, Mushrooms and Carrots. Simmer on low hear for 10 minutes until juicy. Add vegetables to beef and cook for another 10 minutes or until vegetables are soft (especially check for carrot). Prepare thickening: melt Butter, add Flour, stir until smooth, add paprika and cook on low heat until bubbly. Add to the veggies and meat and cook 1-2 minutes. *If you like the gravy thicker, prepare more thickening You can do it by using the gravy from the stew and adding some flour to it. Posted in: Main Courses. Tags: beef, bell pepper, carrot, garlic, mushroom, onion, paprika, tomato paste. Ula, thank you for making these Polish dishes on videos available. My grandparents have since past on, and I didn’t know where to find authentic dishes to make for a coming picnic at work and I found you. Again, thank you! I’m sure I can find a nice mixture to bring into work. How can you cut ground beef into one inch squares? Hi Steven, for the stew, the beef should not be ground, that was a typo, sorry. Dzieki ULA, I am making stew tommorow for my grandparents. They have moved to South Africa to live with us. I am making Goulasz with szpetzle. Looks delicious and I am going to try it for sure. Just a note though, the recipe could be a bit confusing as it calls for 2 lbs of ground beef then goes on to say to cut up the meat into cubes! Might want to clarify the cut of beef to use. ground beef and it says to cut it yet? it is chuck roast beef not ground – now updated, thanks! We visited both Krakow and Budapest, with friends. In both cities we looked forward to trying tge local Goulash. We loved it on both occasions, one served in a small flower pot loaf (Poland) the other with gnocchi (Hungary). I’ve decided to serve this to the same friends, having brought paprika home with me, today, Christmas Eve! So glad to find an authentic traditional decide, which I’ve just put in my slow cooker. It smells delicious!! Looking forward to sharing and eating it later! Thank you! Looking forward to the details even the comment was left loong time ago I hope you still visit this website. I promise to update more often. Your recipe calls for tomato paste, but I do not see where it is written to use it nor how much. I cannot view the video right now, but hopefully it is in the video. Much appreciated if you could be more specific in your written recipe. Do you have a recipe for “lazy “ golamki cassserole? It looks like chunks of beef, not ground beef! What cut was used? Hi Linda, please use chuck roast that is well ‘marbled’ and stay away from packaged ‘stew meat’. Mean for stew should have some fat running through.